Most organisations invest in development programmes because they want people to be better at “doing” a particular task or “behaving” in a particular way. However, what people “do” and how they “behave” is governed more by their by their MINDSET than their skill. 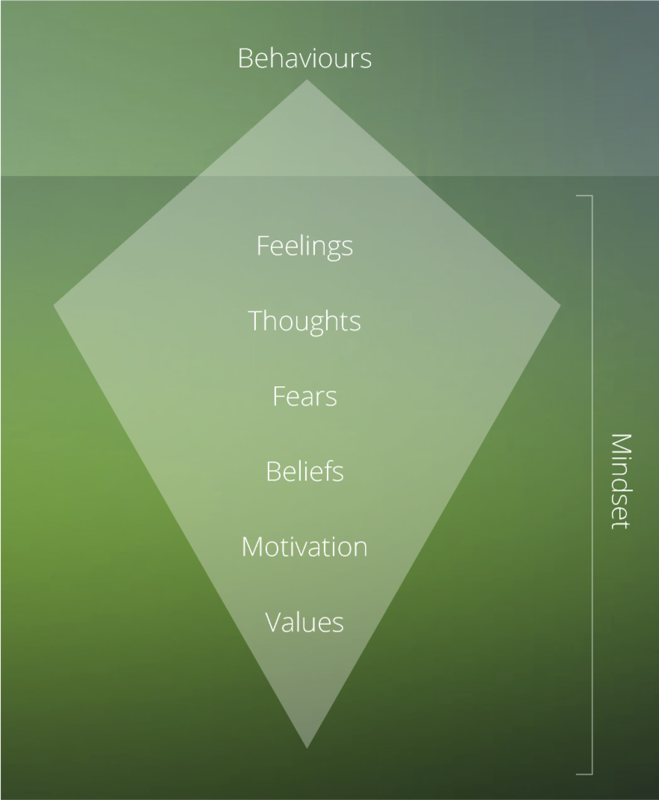 A person’s MINDSET drives what they do, how they do it and therefore ultimately the results they achieve. The Iceberg Model is a perfect metaphor. “Above the waterline” are behaviours and actions. This is the part that is visible. However, it is what is below the waterline – factors such as: willingness to try something new, self-belief, motivation and confidence i.e. a person's MINDSET - that will dictate whether behaviours will actually change and whether any such changes will be sustained over time. Most development programmes fail to have the desired impact because they focus primarily on knowledge and skills and do not engender the MINDSET change that is fundamental to creating lasting behavioural change. Whenever we design and deliver a development programme, MINDSET is always a critical component. We integrate highly effective tools and approaches into all our programmes that focus on building the success oriented attitude and MINDSET that underpins top level performance in any role. No matter who they are, where they work, what role they have or how senior they are, we treat everyone the same – with decency, honesty and courtesy. Everything we do, we do to the best of our ability and with absolute commitment to providing the highest quality learning experiences possible. We continually seek new and better ways to enhance the positive impact of people development in the workplace. We believe people are inherently good. They work hard and want to do well. We see the potential in everyone and focus all our efforts to enable everyone we interact with to thrive and flourish at work.